Ever wanted to melt plastic into fabric? Hehe. Start with 5 or 6 plastic bags. Cut off the handles and cut along the seams to flatten the bags into flat, manageable rectangular pieces. 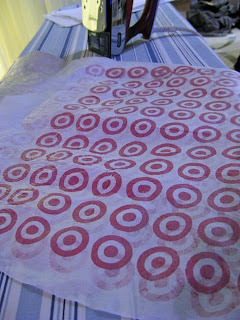 Ideally you want big piece so you end up with a big piece of fabric at the end, but if this is your first time trying this I would recommend using smaller pieces, maybe half of the bag instead of the whole thing. If you only use half a bag, then you just need 3 bags and you have 6 pieces! Lay the pieces on top of eachother, as flat as possible. 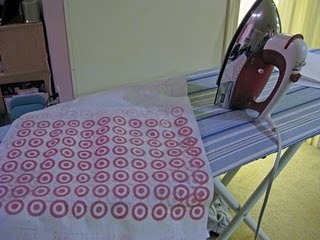 Put butcher paper (or lots of sheets of white paper, nothing with writing or print on it) on your ironing board, then place the plastic sheets over the paper - this will keep the plastic from sticking to your ironing board. 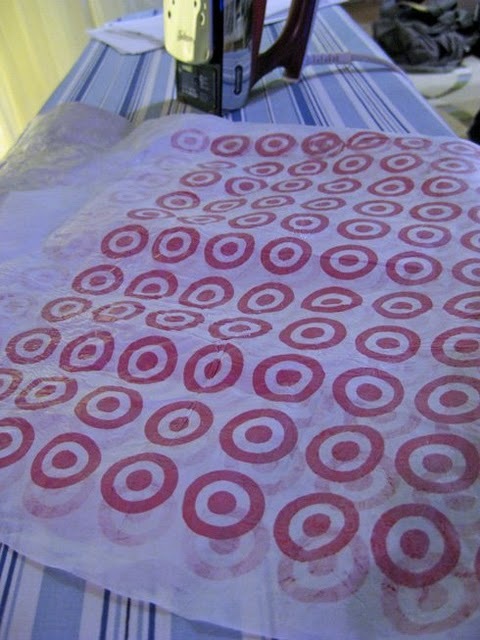 Then place another piece of butcher paper on top of the plastic bags to keep the plastic from sticking to your iron. Iron all of the layers together. I did it all at once, but looking back I think it might be easier to just add one new layer at a time. 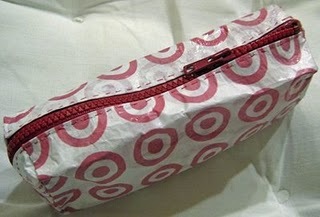 After making the "fabric", you can create nifty little bags like this zippered pencil pouch! It fits my Zune, earbuds and power cables nicely and holds its shape. This was completely hand-sewn and I didn't use a pattern - probably should have. It ended up being just a little bit lop-sided.